« Bird Glyphs, Aztecs, Aries, Hakluyt et al. Is that you, Martin Luther? 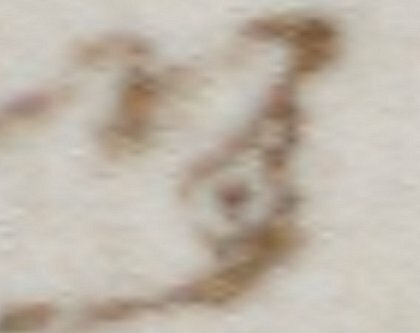 One of my favorite leaves of the Voynich Ms. is f85v, panel 1. There is so much going on- people surrounding what seems to be a pool or fountain, holding various mysterious, but seemingly symbolic objects. One is shaped like a “fleur de lis”, another a sphere with a cap of some sort, and the woman on the bottom seems to be handling a loose ring, or maybe a garland of flowers. There is a sun in the center of the pool, and water or other liquid spewing from four places, each culminating in an arcing spray. In the past I had thought it may represent a solar fountain, a type which would allow the sun to heat an enclosed chamber of air and water. The heat would cause the air to expand, driving the water from the fountain’s tubes. But the presence of the sun in this drawing can be there for so many other reasons, and this may simply depict an ordinary fountain and pool. Is that Luther up top? The objects associated with the individuals are even more mysterious and intriguing. The man to the right is holding what I call a “secular orb”. The orb can be a symbol of the world, and often has a cross on top. This one differs in that it is topped by a cone. What it means is anyone’s guess. Of course the rose has had almost infinite meanings and associations over the years, but the f85 illustration similarity to the Vaughn engraving was, I thought, striking. If there was any connection, it could have implied a Rosicrucian influence. Of course the C14 dating of 1404-1438 for the vellum essentially put an end to all RC speculations, if the opinion of such notable experts as Adam Mclean and Rafel Prinke had not already… they both long felt that the Voynich was not a Rosicrucian document. Then there was the Fleur-de-lis “like” object the man to the left of the fountain is holding. For this symbol, we really have a crowded field of possibilities, and cannot even speculate on which one was meant… if it is meant to be a fleur-de-lis at all! And among the possibles, we again have an RC symbol. So of course, rightly or wrongly, I had reserved a nagging sense that these symbols are in the Protestant/Lutheran/Tudor/Rosicrucian influence somehow, and find myself needing to quell such beautiful theories with that Ugly Fact of C14. And in this light, I was drawn one day to examine the ring of the man at the top of the image (seen above, next to Martin Luther). It seemed this character was proud of his ring… that it was important somehow, being so prominently displayed. I blew it up as well as the SID would allow me, and I was surprised top see that there is a dot of red at the center. At least I think it may be red, and if so, it is the only red on the page. It also seems to have several “protrusions” around the center, and these are necessarily extremely small. Only the smallest crow quill, or brush hair, would have been used to make these fine details, I think. Unfortunately, even the great detail of the SID falls short of the necessary information. Is it really red, or just the reddish tint as found near many other lines? Are those points on the ring petals, or just mistakes of the strokes, or what? 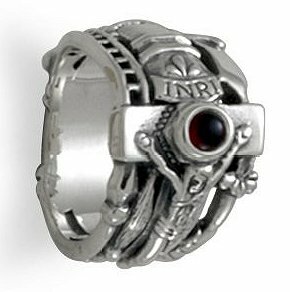 But in any case, I took the position that this was a ring, that it was red in the center, and that it may be a signet ring of some kind. 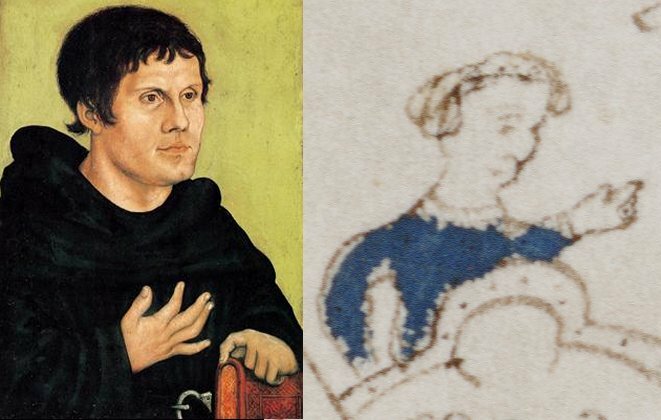 So I put various permutations of ruby/ring/signet and so on, in Google, with “Renaissance” and “Medieval”, and so on… and came up with an interesting phenomenon: Martin Luther was pretty well known for two rings, and both of them had a red center. The first was a signet ring made in the form of his well known rose/cross symbol. Again, back to the C14: It shows a date of vellum creation at about 50 years before Martin Luther’s birth of 1483. And of course he did not become famous many years later, in the mid-16th century. However I do find myself coming back to the feeling that this is a mid-16th century document, at the earliest, and do not feel it all that outrageous that 100 year old vellum was used to make it. And if it was, and adding to that possibility that many have seen a Germanic influence, and also, that this does not seem to be a Catholic work in so many ways… I would like to add to the discussion the possibility that the f85r man could be Luther. If so, we have a chicken/egg thing here: Luther and Protestantism are considered major influences on the Rosicrucian movement. But the RC movement began much later than is probable for the Voynich. 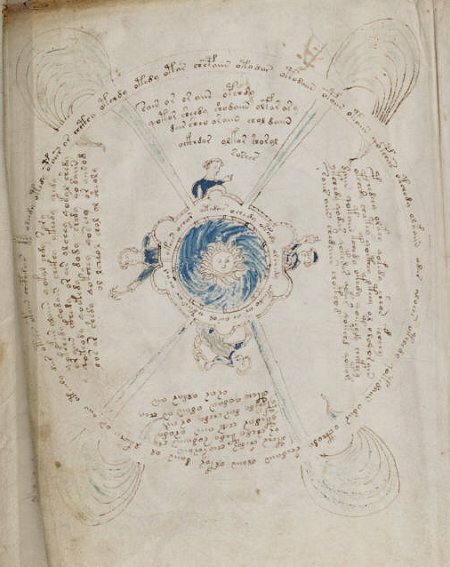 But could it be possible it is the other way around, and that the Voynich, or works like the Voynich, containing similar symbolism, are part of the influence on Rosicrucianism? This work itself is believed to have been owned by Rudolf II, and would have been of interest to his scholars and followers, who were very interested in the “Aura of the Ancient Tome”, and lost mystical arts. And core to the Rosicrucian mythology is the discovery of an ancient book, the Book M, containing all the knowledge of the world, and completely in a unique cipher. Sound familiar? 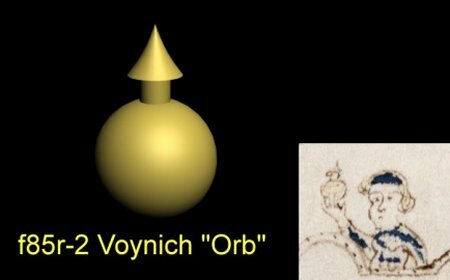 So as a counterpoint to my past speculation about the Voynich being influenced BY the Rosicrucians, I pose this, “What if it is the other way around?”. This entry was posted on December 5, 2010 at 11:19 am and is filed under Dating the VMs, history & provenance. You can follow any responses to this entry through the RSS 2.0 feed. You can leave a response, or trackback from your own site.